Before they had even entered the world, Children's National doctors had hatched a plan to safely deliver and then separate conjoined twins Tyson and Tyler. The treatment for tetralogy of Fallot is surgery--our heart surgeons have a 100 percent survival rate in tetralogy of Fallot repair. See our heart surgery outcomes. Tetralogy of Fallot (TOF or "TET") is a condition of several related congenital (present at birth) defects that occur due to abnormal development of the fetal heart during the first eight weeks of pregnancy. "Tetralogy" refers to four heart problems. The fourth problem is that the right ventricle becomes enlarged as it tries to pump blood past the obstruction into the pulmonary artery. Normally, oxygen-poor (blue) blood returns to the right atrium from the body, travels to the right ventricle, then is pumped through the pulmonary artery into the lungs where it receives oxygen. Oxygen-rich (red) blood returns to the left atrium from the lungs, passes into the left ventricle, and then is pumped through the aorta out to the body. Maternal abuse of alcohol during pregnancy, leading to fetal alcohol syndrome, is linked to tetralogy of Fallot. Mothers who take medications to control seizures and mothers with phenylketonuria are also more likely to have a baby with tetralogy of Fallot. Tetralogy of Fallot may also occur as part of a syndrome like Down syndrome or DiGeorge syndrome. Most of the time, this heart defect occurs sporadically (by chance), with no clear reason evident for its development. Why is tetralogy of Fallot a concern? The amount of oxygen-poor (blue) blood that passes through the VSD to the left side of the heart varies. If the right ventricle obstruction is severe, or if the pressure in the lungs is high, a large amount of oxygen-poor (blue) blood passes through the VSD, mixes with the oxygen-rich (red) blood in the left ventricle, and is pumped to the body. The more blood that goes through the VSD, the less blood that goes through the pulmonary artery to the lungs, and the less oxygen-rich (red) blood that returns to the right side of the heart. Soon, nearly all the blood in the left ventricle is oxygen-poor (blue). This is an emergency situation, as the body will not have enough oxygen to meet its needs. Some situations, such as crying, increase the pressure in the lungs temporarily, and increasing blueness might be noted as a baby with tetralogy of Fallot cries. In other situations, the pathway from the right ventricle to the pulmonary artery becomes tighter, preventing much blood from passing that way, and allowing oxygen-poor (blue) blood to flow through the VSD into the left heart circulation. Both of these situations are nicknamed "TET spells." Sometimes, steps can be taken to lessen the pressure or the obstruction, and allow more blood to flow into the lungs and less through the VSD. These steps, however, are not always effective. Because large amounts of oxygen-poor (blue) blood can flow to the body under certain circumstances, one of the symptoms of tetralogy of Fallot is blueness (blue color of the skin, lips, and nail beds) that occurs with such activity as crying or feeding, and quickly becomes more obvious. Some babies do not have noticeable cyanosis (blue color of the skin, lips, and nail beds), but may instead be very irritable or lethargic due to a decreasing amount of oxygen available in the bloodstream. Some children become pale or ashen in color, and may have cool, clammy skin. Any of these can be symptoms of tetralogy of Fallot. The symptoms of tetralogy of Fallot may resemble other medical conditions or heart problems. Always consult your child's doctor for a diagnosis. 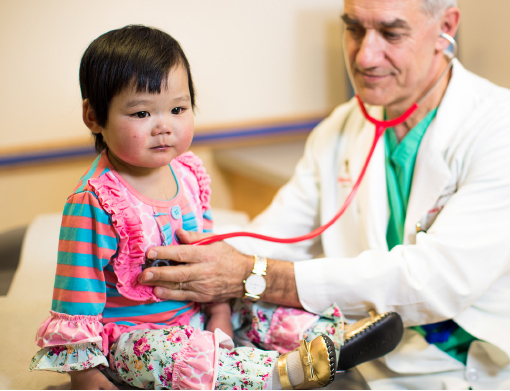 Your child's doctor may have heard a heart murmur during a physical examination, and referred your child to a pediatric cardiologist for a diagnosis. In this case, the heart murmur is caused by the turbulence of blood flowing through the obstruction from the right ventricle to the pulmonary artery. Symptoms your child exhibits will also help with the diagnosis. Chest X-ray. A diagnostic test that uses X-ray beams to produce images of internal tissues, bones, and organs onto film. Children's National Heart Institute performed 19 tetralogy of Fallot repairs last year, with a 100 percent survival rate. Read about our other cardiac surgery outcomes. Tetralogy of Fallot is treated by surgical repair of the defects. A team of cardiac surgeons performs the surgery, usually before an infant is 1 year old. In many cases, the repair is made at around 6 months of age, or even a little earlier. Repairing the heart defects will allow oxygen-poor (blue) blood to travel its normal route through the pulmonary artery to receive oxygen. The ventricular septal defect is closed with a patch. The obstructed pathway between the right ventricle and the pulmonary artery is opened and enlarged with a patch. If the pulmonary valve is small, it may be opened as well. Learn what to expect following surgery and how to take care of your child once they return home. Tetralogy of Fallot repair surgery is often performed on an infant less than 1 year old. Last year, our cardiac surgeons performed 19 tetralogy of Fallot repairs with a 100 percent survival rate.